The Austrian Filmfestival and its short film section, Two Moods Festival, was founded to give filmmakers from Austria, especially from Vienna, the chance to have their premieres in a festival in Vienna. The first festival took place April 2010. Despite the existence of film festivals in Vienna, most Austrian films are world premiered at festivals outside Austria, because festivals like Viennale and Vienna Independent Short mainly want to bring films from the world to Austria. 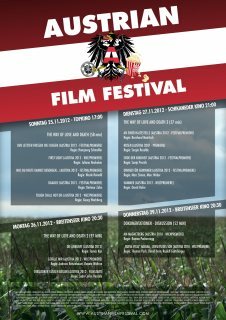 Two Mood Filmfestival accepts mainly Austrian shorts for their Viennese, Austrian, World or Prepremieres and selects the best of them, which fit the given topics (moods). The styles vary from experimental, purely narrative, essay film - all style allowed. Also 3D-films are allowed. The presence of most directors at the festival gives the chance to discuss about the films. The next festival will take place 20/11/2011 in Vienna. Projection formats: 16mm, 35mm, DVD, MiniDV, DCP, files (fomats MOV, MP4, WMV or AVI, HD or SD), BluRay..